Description of "Advanced Guide On Disaster Management Natural & Manmade Volume - III (eBook)"
VOLUME III OF ADVANCED GUIDE ON DISASTER MANAGEMENT deals with MAN MADE DISASTERS. Man Made disasters may occur either through negligence or deliberately. They can occur either accidently or due to defective designs. Mechanics of man-made disasters will invariably be caused directly or indirectly by human actions either acted upon in good faith or by malafide intentions. Man-made disasters can also occur due to interference by humen in environments and ecosystems. 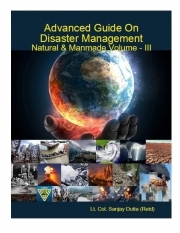 Reviews of "Advanced Guide On Disaster Management Natural & Manmade Volume - III (eBook)"